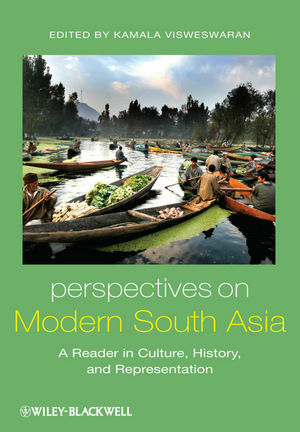 Perspectives on Modern South Asia presents an exciting core collection of essays drawn from anthropology, literary and cultural studies, history, sociology, economics, and political science to reveal the complexities of a region that is home to a fifth of humanity. Kamala Visweswaran is Associate Professor of Anthropology and South Asian Studies at the University of Texas, Austin. She is the author of Fictions of Feminist Ethnography (1994), Uncommon Cultures (2010), and the forthcoming A Thousand Genocides Now: Gujarat in the Modern Imaginary of Violence. Introduction: Reconceptualizing Nation and Region in Modern South Asia (Kamala Visweswaran). Part I Debates about Origins: Pre/Modern Religious Pluralities in South Asia. 1 Beyond Ethnicity? Being Hindu and Muslim in South Asia (Shail Mayaram). 2 Towards a Composite Reading of South Asian Religious Cultures: The Case of Islam (Syed Akbar Hyder). 3 Tolerant Hinduism: Shared Ritual Spaces – Hindus and Muslims at the Shrine of Shahul Hamid (Vasudha Narayanan). 4 Hindu Gods and Us: Our Goddesses and the Hindus (Kancha Iliah). Part II The Study of South Asian Society and the Emergence of Modern Forms of Social Classification. 5 Notes on the History of the Study of Indian Society and Culture (Bernard Cohn). 6 A Note on Sanskritization and Westernization (M. N. Srinivas). 7 What’s in a Name? Aryans and Dravidians in the Making of Sri Lankan Identities (Arjun Guneratne). 8 Politics of Ethnicity in India and Pakistan (Hamza Alavi). 9 Ethnicity, Caste and a Pluralist Society (Rajendra Pradhan). Part III Partition, Nationalism, and the Formation of South Asian National States. 10 Abducted Women, the State and Questions of Honour: Three Perspectives on the Recovery Operation in Post-Partition India (Ritu Menon and Kamla Bhasin). 11 Identity, Violence and Women: A Reflection on the Partition of India 1947 (Nighat Said Khan). 12 The Quest for National Identity: Women, Islam and the State in Bangladesh (Naila Kabeer). 13 Nationalist Agendas and Women's Rights: Conflicts in Afghanistan in the Twentieth Century (Valentine M. Moghadam). 14 The State and National Foundation in the Maldives (Rizwan A. Ahmad). Part IV States and Communal Conflict in South Asia. 15 Reflections on Communal Violence in South Asia (Stanley J. Tambiah). 16 Ayodhya: The Modernity of Hinduism (Pankaj Mishra). 17 Identity on the Borderline: Modernity, New Ethnicities, and the Unmaking of Multiculturalism in Sri Lanka (Darini Rajasingham-Senanayake). 18 War, Factionalism, and the State in Afghanistan (Nazif M. Shahrani). Part V Development and Liberalization. 19 Development Regimes in South Asia: History and the Governance Conundrum (David Ludden). 20 Radical Needs and Moderate Reforms (Amartya Sen). 21 Who Are the Country’s Poor? Social Movement Politics and Dalit Poverty (Gopal Guru and Anuradha Chakravarty). 22 Politics of the Poor? NGOs and Grass-roots Political Mobilization in Bangladesh (Lamia Karim). 23 The Politics of 'Developing Nepali Women' (Seira Tamang). 24 "ity of Whores": Nationalism, Development, and Global Garment Workers in Sri Lanka (Sandya Hewamanne). 25 Indo-Bhutan Relations Recent Trends (Tashi Choden). 26 From Chipko to Sati: The Contemporary Indian Women's Movement (Radha Kumar). 27 Women's Movement in Pakistan: State, Class, Gender (Shahnaz Rouse). 28 Monsoon Risings: Mega-Dam Resistance in the Narmada Valley (Chittaroopa Palit). 29 Where There Are No Men: Women in the Maoist Insurgency in Nepal (Shobha Gautam, Amrita Banskota and Rita Manchanda). 30 Developing the Anti-Nuclear Movement (Achin Vanaik). 31 Pakistan's Fateful Nuclear Option (Zia Mian).